1. First, preheat the oven to 190°C. Chop the onion and fry in the olive oil on a medium heat, in a large, ovenproof casserole dish. Meanwhile, chop the pepper and add this to the pan, and stir fry until they soften. 2. Add the diced butternut squash and continue to fry the vegetables for a couple of minutes, before then mixing in the tinned tomatoes and beans. 3. Next, add the tomato purée, balsamic vinegar, chilli powder, cumin and water and stir through - simmer for three minutes. 4. Move the pan into the oven on a medium heat (190°C) to cook for around 30 minutes. 5. While this is cooking, you can prepare the guacamole. Simply peel and mash the avocado in a small bowl, then add in your lemon juice and coriander. Continue mashing until the guacamole is as smooth or chunky as you like it, then cover and place in the fridge until ready to eat. 6. Five minutes before the chilli is ready to come out of the oven, line four cereal-sized, ovenproof bowls with one tortilla each, so they form a bowl shape. Place these in the oven for around three minutes until the wraps go slightly crisped around the edges. 7. 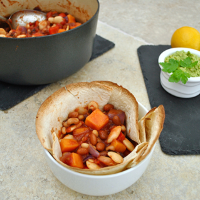 When everything is ready to serve, divide the chilli evenly between the four tortilla-lined bowls. Serve with the remaining four wraps (ideal for dunking! ), guacamole, salad, salsa and whatever other sides you like!